The Secretary-General of the Council of Ministers, Mahdi Al-Alaq Federation of Iraqi Chambers of Commerce to take its role in the development of the economy of the country and invest the government's direction to improve its reality in light of what contained the government program of materials important to restore life to the private sector and create a healthy environment and free investment. This came during a seminar held by the Federation at the Hospitality Palace entitled "Participation of the Commercial Decision between the Government Sector and the Private Sector to Resolve Commercial Crises", in the presence of a number of members of the House of Representatives and related government institutions in addition to representatives of the private sector in Iraq to discuss the working paper activating economic activities and managing sectors Trade, industry, agriculture and other sectors. The working paper reviewed the legislation and the provision of infrastructure to stimulate the private sector and support the decisions issued by the government in this regard, as well as a set of proposals and actions that contribute to the drawing of a road map to implement the strategy to support the private sector. The Union presented a presentation entitled "Consumer Protection and Fair Trade" to the importance of this subject and the social and moral responsibility, in addition to the introduction of a set of files that correspond to the requirements of the current phase. 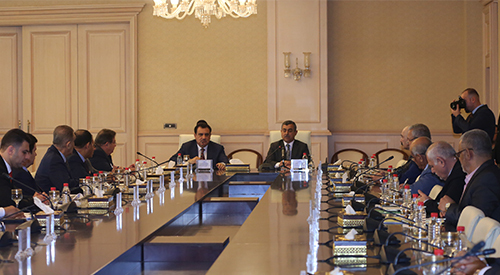 The symposium concluded with a number of recommendations that will be adjusted and decisions and instructions issued to be submitted to the Council of Ministers and presented in one of the upcoming meetings.